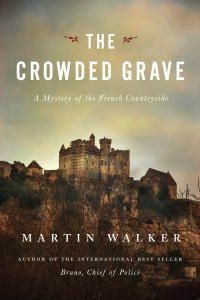 The Crowded Grave by Martin Walker: Synopsis and Online Purchase Options. Synopsis (from the publisher): It's spring in the idyllic village of St. Denis, and for Chief of Police Bruno Courrèges that means lamb stews, bottles of his beloved Pomerol, morning walks with his hound, Gigi — and a new string of regional crimes and international capers. When a local archaeological team looking for Cro-Magnon and Neanderthal remains turns up a corpse with a watch on its wrist and a bullet in its head, it's up to Bruno to solve the case. But the task will not be easy, not with a meddlesome new magistrate eager to make a strong impression, an ongoing series of attacks by animal rights activists on local foie gras producers, and a nearby summit between France and Spain approaching — not to mention two beautiful, brilliant women vying for Bruno's affections. Complicating events even further, the professor in charge of the dig is soon reported missing, leading Bruno to suspect that the past and the present are bound up in dangerous ways. As summer approaches, the wine growing cooler and the fruit sweeter, Bruno's investigations take him indelibly deeper into contemporary Europe's dark history of terrorist and counterterrorist tactics — and toward a dramatic finale.